Hidden in the back pages of some major dailies, there was news that the third Samjhauta bomber was held in MP (16, Dec 2012). National Investigation Agency (NIA) arrested Rajender Choudhary, near Ujjain in MP. He has been named as one of the bombers in the supplementary charge sheet submitted by the agency. One recalls that in the blast in Samjhauta Express, way back in 2007, resulted in the death of 68 persons, including 43 Pakistanis. The investigation showed that there were four brief-case bomb planters, who allegedly acted on the instructions from RSS pracharak Sunil Joshi, Sandeep Dange and Ramchandra Kalsangra. Of these Sunil Joshi was later murdered. Many others’ from this camp, who are cooling their heels behind the bars in jails, are Swami Aseemanand and company. This series of blasts like Mecca Masjid, Malegaon, Ajmer etc. were planned at times when religious conglomeration of Muslims at major festivals was there, so that the casualty is large. The first striking point of this news is the under projection of the arrest. If we remember in earlier phase, when for the same incidents of blasts the innocent Muslim youth were arrested, there were banner headlines in all the news papers and anchors of TV channels were screaming to the highest pitch. In this projection the language press added all the necessary spices to highlight the religion of the arrested culprits. This was followed by the under reporting of the judgments, which found these Muslim youth innocent and then these youth were let off. Such news was again hidden in the back pages as small news items if at all. The pattern of media reporting showed a clear-cut bias in the nature of reporting. Unfortunately the media pundits have also ignored this major phenomenon of the pattern of reporting in case of communal violence and terrorist violence. In case of communal violence the large section of media accepted the version from police or dominant prevalent versions in an uncritical manner. In case of terrorist violence the media reported events with the underlying theme as if all terrorists are Muslims. The attitude of police also was on these patterns in both communal and terrorist types of violence. In terrorist violence the arrest of Muslim youth was done with striking regularity, till the motorcycle of Sadhvi Pragya Singh Thakur, an ex ABVP worker, was discovered by Hemant Karkare. Till that time the earlier chiefs of ATS in Maharashtra and other states where blasts took place, were playing it cool. In most these cases the involvement of those associated with RSS ideology was not given a serious thought. 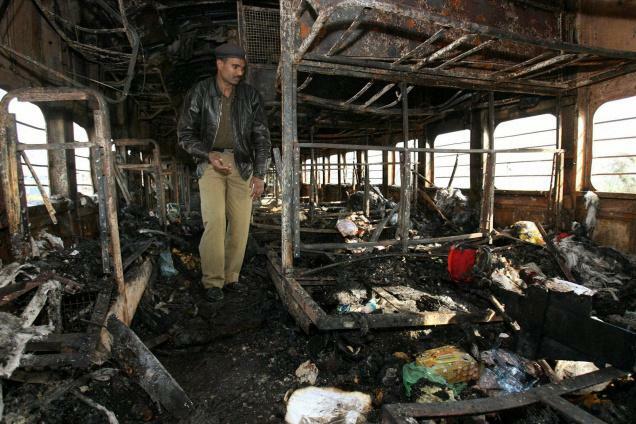 When in April 2006 the blast took place in Nanded in the house of RSS activist Rajkondavar. In front of the house there was a board of Bajrang Dal and the saffron flag was fluttering. There was enough evidence to take the investigation further, which might have led to arrest way back of those who are currently in jails. Since large section of police preferred to be guided by biases rather than professionalism, the investigation remained half way and the series of blasts kept taking place. To arrest the Hindus for acts of terror was an ‘unthinkable thought’ for most investigating officers. To highlight this in media was not might not have been thought appropriate by the media. The police and media, both, focused on the ‘thinkable thought’ and projected Muslims as the culprits. This thinkable thought was product of the US propaganda duly taken up by the National media. As per this ‘All Muslims are not terrorists but all terrorists are Muslims’. When Hemant Karkare decided to go ahead in a professional way, the path was not easy for him. He soon faced the political pressure from some sections. Bal Thackeray in his paper Saamna wrote, that we ‘spit on the face of Hemant Karkare, while Narendra Modi said that Hemant Karkare is Deshdrohi (Anti National). The death of Hemant Karkare was a big setback to the investigation of blast cases. But the path was paved for thinking on these lines which were unthinkable earlier. With confession of Swami Aseemanand in presence of a magistrate, which he later retracted, the evidence cam forth clearly on which Rajasthan ATS and now NIA and other police agencies may be working meticulously to bring out the truth of these blasts. While the arrest of Muslim youth was going on recklessly, some social activists tried, in vain, to draw the attention of the state and investigating agencies, about the arrest of innocents. That the real culprits are being overlooked was the underlying statement. These social activists were ignored till the people’s tribunal “Scapegoats and Holy Cows’ held in Hyderabad (August 2008) brought forward the truth for public and states’ attention to the tragic reality of blasts and the reality about the culprits who were getting away and the innocents were being arrested. Needless to say that due to such arrests, the social life and careers of those innocents who were arrested was ruined. Even now lot of questions persist; about Batla encounter and the alleged role of Azamgarh youth in the acts of terror. Some political leaders have been raising the issue but state so far has been very apathetic to the plight of Muslim youths and their families who have been implicated in this incident. Now some hope is being rekindled that these innocents may get justice as on one hand the professional attitude of NIA is nabbing the real culprits and hopefully will ensure that the guilty are punished by the court of law. At the same time, though painfully late, the delegation led by Ram Vilas Paswan met the Prime Minister and submitted the memorandum on the issue. The Prime minister has promised that “The government will soon constitute a mechanism to stop arresting innocent youth, providing justice to them and their rehabilitation.” Dr. Singh also assured that he will talk to the Home Minister in this regard. One does not know how the state is planning to compensate the innocent youth, who have suffered immensely at the hands of the insensitive state machinery. Will Government gather courage to institute an inquiry into Batla encounter and bring forth the truth? One presumes after the Nanded blast (April 2006), which was an accident in which the Bajrang Dal activists making the bombs were killed, had the investigation been taken to its logical conclusion many a blasts might have been prevented and many an innocent lives saved. That’s a conjecture, which sounds to be a strong possibility in the hindsight. Will this be a lesson to our concerned authorities to learn from and a pointer to adopt a more professional attitude in future?